Sunday May 18th 1890 I was busy about the house work all the morning till time for church. Will and I went to the Presbyterian. I helped through with the dinner and Mother and I read and rested in the afternoon. Ott and Fanny were over for supper and Hatt and the children later they all stayed till just dark and then will and I went over to Marys for an hour. 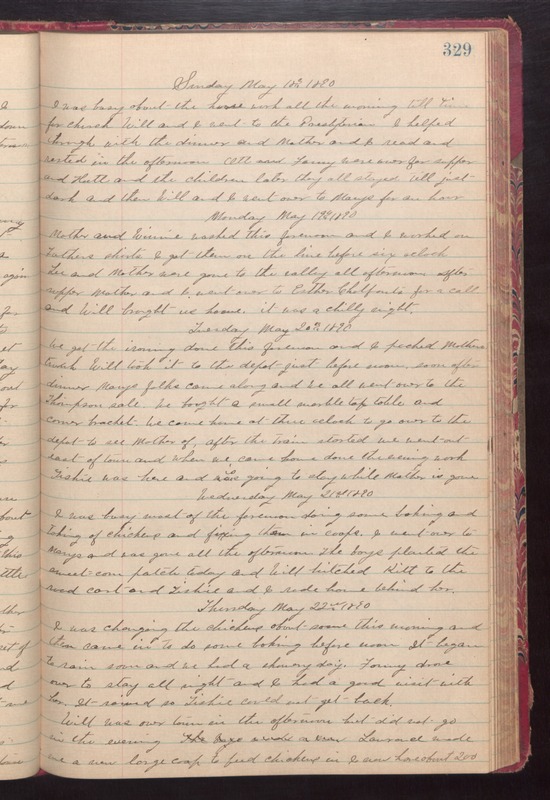 Monday May 19th 1890 Mother and Winnie washed this forenoon and I worked on Fathers shirts I got them on the line before six oclock Lee and Mother were gone to the valley all afternoon. After supper Mother and I went over to Esther Chalfonts for a call and Will brought is home. it was a chilly night. Tuesday May 20th 1890 We got the ironing done this forenoon and I packed Mothers trunk. Will took it to the depot just before noon. soon after dinner Marys folks came along and we all went over to the Thompsons sale. We bought a small marble top table and corner bracket. We came home at three oclock to go over to the depot to see Mother of. After the train started we went out east of town and when we came home done the evening work. Tishie was here and is going to stay while Mother is gone. Wednesday May 21st 1890 I was busy most of the forenoon doing some baking and taking of chickens and fixing them in coops. I went over to Marys and was gone all the afternoon. The boys planted the sweet corn patch today and Will hitched Kitt to the road cart and Tuishie and I rode home behind her. Thursday May 22nd 1890 I was changing the chikcens about some this morning and then came in to do some baking before noon. It began to rain soon and we had a showery day. Fanny drove over to stay all night and I had a good visit with her. It rained so Tishie could not get back. Will was over town in the afternoon but did not go in the evening. Laurence made me a new large coop to feed chickens in I now have about 200.